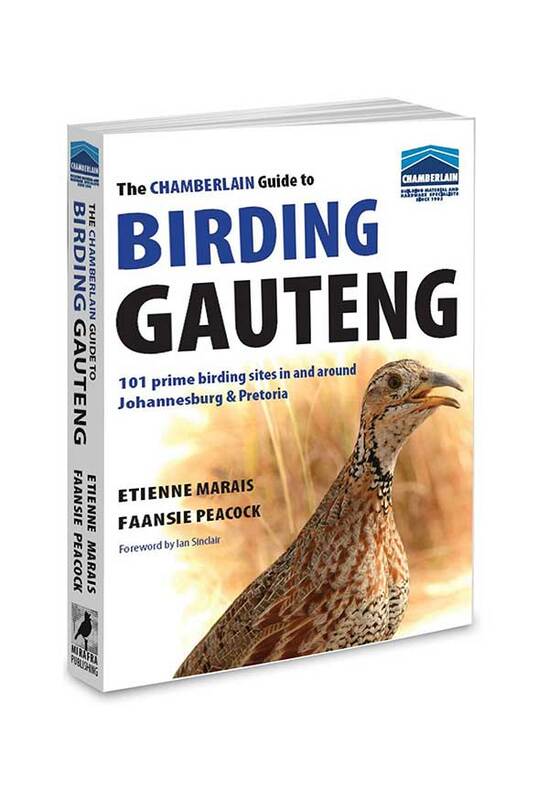 Here you will find downloadable content associated with the book, THE CHAMBERLAIN GUIDE TO BIRDING GAUTENG. This includes an annotated checklist to the birds of the wider Gauteng region, and GPS and GoogleEarth waypoints that correspond to the birding site numbers in the book. Inevitably, site-specific information is bound to change in a guide such as this book; as such we have included a few updates to specific sites that were sent to us by readers. We appreciate the support! This annotated checklist includes all the birds which can be seen using this book as a guide. The focus of the list is the region covered by the first six chapters of the book (JHB to SW; collectively refered to as the greater Gauteng region = GP). Information pertaining to Further Afield (FA) sites is only given where the species does not occur in the greater Gauteng region (GP) or is difficult to find here and best sought in FA. Each entry provides the bird’s common name, scientific name in italics, and Afrikaans name in [square brackets]. Endemics and Near-endemics are printed in blue. Where applicable, ‘PIC’ provides the page number on which a photo of the species can be seen; and ‘INFO’ leads to more detailed information on the bird in question. This is followed by information on the bird’s habitat, seasonality and abundance. The entry is concluded with the numbers of the sites (not pages) where the species may be found—the best or most reliable sites’ numbers are printed in bold. Due to space constraints, suggested sites are not listed for the most common species. The links to the right provide GPS Data Waypoints corresponding to the red circles indicating birding spots on the maps of each site. The waypoints are for Garmin and other compatible GPS units. Waypoints are organised by chapter. Many chapters have more than 200 waypoints, and most GPS units will not take more than 500, so it is best to upload just the chapter that you are planning to visit. Unzip the download, and you should see the separate chapters. To use this data with Mapsource you need to connect to your GPS unit using Mapsource, or some other Garmin-compatible programme (such as Ozi-explorer). You can then load the points onto your GPS unit, which will then show the waypoints on your screen. You may also use the waypoints for navigation with an auto-routing GPS if the point lies on or close to a road. Please let us know should you find any errors. Thanks to Niall Perrins for his help with data conversion. Check out all the Birding Gauteng spots in Google Earth! Click on the link to the right to download the entire selection of Google Earth files in zipped format. These ‘.kmz’ files can be opened in Google Earth, and allow you to browse the birding spots by way of satellite imagery. The files are organised by Chapter. Points are numbered according to the numbers used in the text, and correspond to the numbered red circles on the birding site maps. Using Google Earth together with The Chamberlain Guide to Birding Gauteng will enable you to really get a feel for each birding spot and plan your trip in fine detail! Inevitably, the site-specific details contained in a book of this nature are prone to changing on a regular basis. As such we have provided a few updates or corrections below – this section provides updated information relating to e.g. access conditions which may have changed, road conditions, contact details, new sightings and also additional accommodation listings. If you discover a mistake or would like to notify us of an update applicable to one of the sites, please do not hesitate to drop us an email – we will greatly appreciate it! ROOIWAL SEWERAGE WORKS (SITE 36, p. 93). Access arrangements to the Rooiwal Sewerage Works have changed. Contact Mrs Marietjie Wolmarans on 072-190-3474 to arrange a permit (working hours on weekdays). The normal procedure is that you need to sign an indemnity form. Birding remains as described in the book from Page 93. (Ida Nel; 2 Nov. 2010). MAGOEBASKLOOF & WOODBUSH FOREST (Site 89, p. 300). The Bat Hawk site at Rooikoppies has been abandoned by the Bat Hawks. Birders may want to visit another Bat Hawk site at Agatha, south of Tzaneen. Contact David Letsoalo (see p. 300) for information on this Bat Hawk site. The birds were seen on the nest on 15 October. You lose some, you win some…Magpie Mannikin is a sought-after bird which has become regular in gardens in Tzaneen. Contact David Letsoalo (see page 300) for more information on where to find these gem. The location of “Owl Cottage” on the map on p. 303 is incorrect. If you are going to Owl Cottage please phone them for directions, at 015-305-4428. (Etienne Marais; 18 Oct. 2010).